We stop in a town called Bondurant that in a nutshell illustrates the ebb and flow of the local economic tides. 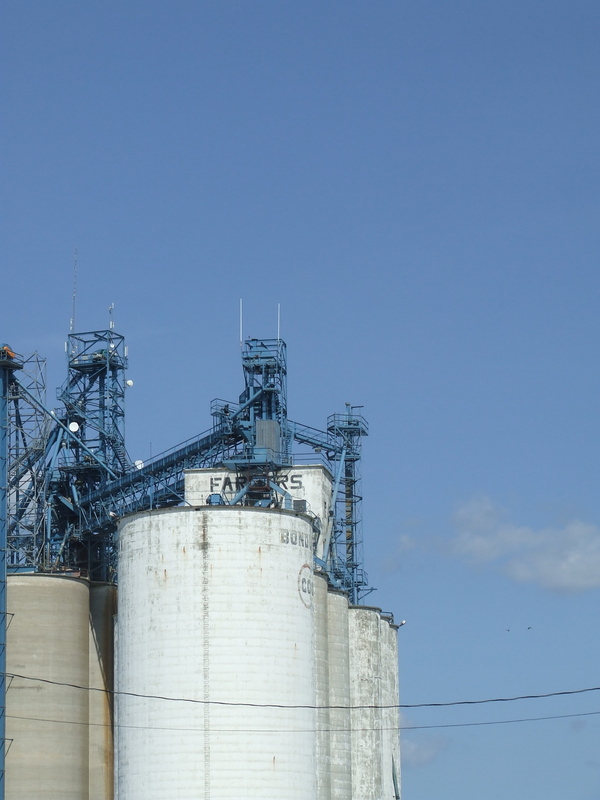 The concrete pillars of grain elevators dominate the center of town like monoliths. There’s a small train depot in their shadow that has now become a park. The railroad is gone, replaced by a bike trail running into the heart of Des Moines. This was a farm town, and though still surrounded by corn and soy, it’s now clearly an appendage to Des Moines, which is a fifteen-minute commute away. This explains the glut of new housing developments. The downtown holds several buildings for rent, a hair salon, dentist office, and a single pub. There’s no commercial center, though there is a brand new library and community center, as well as a new high school and elementary school. It feels like a community being pulled into the suburban orbit of Des Moines. “The farmer on a small farm,” a local farm manager tells us, “doesn’t make money because he isn’t disciplined or motivated.” Small farms grow or die. The same thing seems to happen to small towns. “Everything in this country comes back to income.” And yet he claims to manage many heritage farms, where absent landlords view their property as something more than simply an investment. In all of this, I’m trying to understand the cultural ties to the land, be it small town, farm, or suburban. Who invests in the land for its cultural value? And what’s the value of culture when crops are seen as commodity? 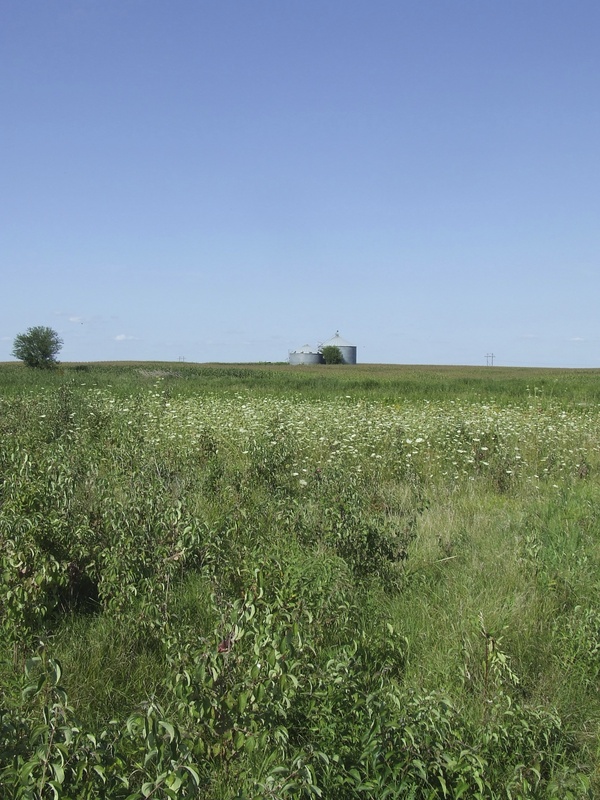 My surprise finally comes when we pull off the road to a “Public Area,” a space carved out of the grid-work of corn and soy and allowed to revert back to prairie. What strikes me is the soundscape: birds and the various chirps, whirring, and buzzes of insects. We had stopped in a cornfield earlier, and compared to this the cultivated land was deadly silent, as the loud life around me now would be considered pests in the fields of corn across the street. I try to imagine that sound, giving way to the absolute silence of growing crops. Monoculture is quiet. Diversity is loud. The same thing holds true of neighborhoods, I think. We pass housing developments where the homes look like they’ve fallen from the sky into the subdivision that was recently a field. No sidewalks, no families on porches, no baseball in the street. There’s not much diversity in these neighborhoods, either of culture or architecture that I can tell. In these suburbs, where the houses push right up against the cornfields, whatever is growing inside is growing silently, like ears within the husks. This entry was posted in Writings and tagged agriculture, farming, Iowa, NCHC, photo essay on August 22, 2015 by boldsaintcroix.